Our personalised wrapping paper is the ideal product for any occasion, event or retail opportunity. Our high-quality products are printed on sumptuous silk, glorious gloss or retro 100% recycled paper, all 100gsm. You can also be assured that our wrapping paper sheets are printed with vegetable oil-based inks and made from materials from sustainable sources. As green as it is gorgeous! Printed litho, supplied flat and trimmed to 500mm x 700mm; this big sheet goes a long way towards personalising your gifts or promoting your business. Or pick our special A3 (297 x 420mm) wrapping paper which is ideal for in-store gift wrapping services. NEW! Super bright, can't miss it Neon bright wrapping paper sheets - the new hot property. Available in Hot Pink, Lime Green or Bright Orange for a bespoke wrapping paper that is really going to stand out from the crowd! Printed on 115gsm Silk Art or 100gsm recycled uncoated paper we can can supply these as flat sheets or folded and inserted in to poly-bags ready to hit the shelves. 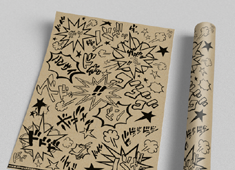 Have your own designs transformed into fabulous wrapping paper sheets, each one a big 500 x 700mm. 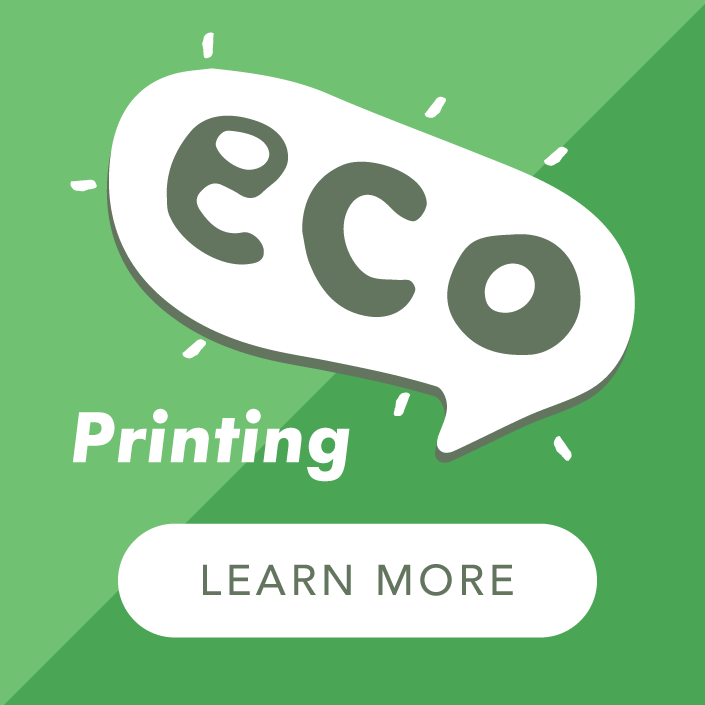 Choose from printing on Gloss, Silk or Recycled papers, all from sustainable sources and eco-printed with vegetable oil based inks. Supplied flat with the option to add folding and inserting for the total retail item. If you are searching for something a bit different and love the kraft papers that are popular at the moment have a peek at this gorgeous alternative. We eco-print a big 500 x 700mm sheet with one of our own unique kraft style backgrounds with your designs incorporated to create a unique 'kraft' wrapping paper. Genius! Add some luxury to gift wrap with our rather special gold or silver metallic wrapping paper. Printed on 115gsm Silk Art for a luxurious product, these sheets can also be supplied flat, or folded and inserted in to poly-bags. 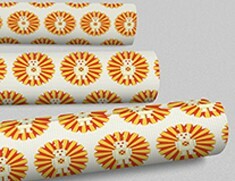 Enjoy a little more flexibility and a little less cost with our new lighter weight wrapping paper. Printed on 80gsm recycled uncoated paper our new wrapping paper is still printed with eco-friendly inks and supplied at our standard 500 x 700mm. Perfect for in-store wrapping paper. Enjoy! 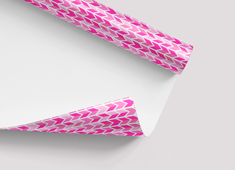 Our A3 wrapping paper printing is ideal for in-store product and /or gift wrapping services. Using an A3 sheet can mean less waste as it is easier to handle, often with less 'trimming' being discarded. Available in Silk, Gloss and Recycled papers, all eco printed using vegetable oil based inks. Plus, this product comes with our amazing Multiple Designs offer - order 1, 2 or 4 designs for the same published price! 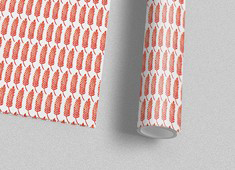 Want Multiple Designs of Wrapping Paper? Fancy more than one design within your wrapping paper order? 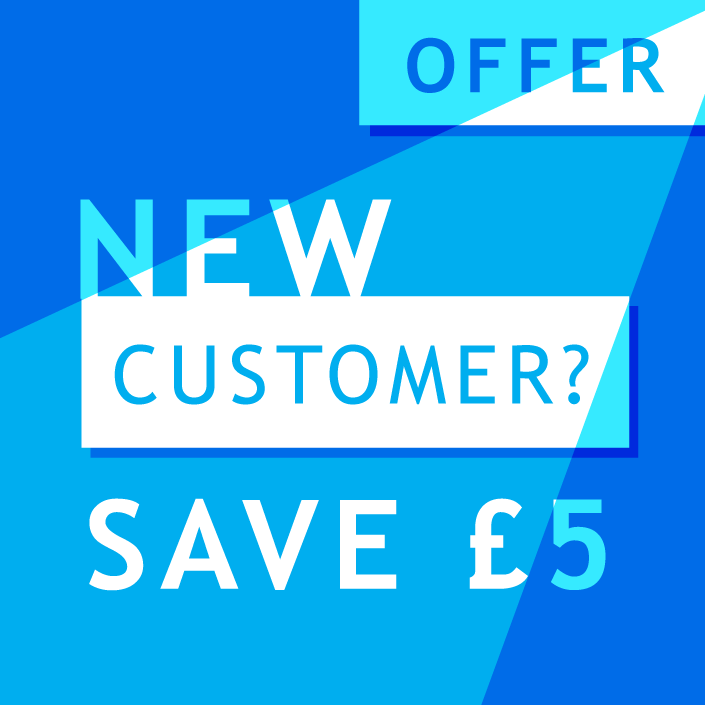 Simply order the total number of sheets you require and then order up to five additional designs that you want printed within that total quantity. Find this option in 'Build Your Order' on the product ordering page.  "I've just received delivery and wanted to thank you for doing such a great job. You've matched the proof I mailed over and I couldn't be happier with the result, superb!" "I just want to say thank you for such a speedy service and such wonderful paper! I will definitely be getting more from you in the future"
Matching shoes and handbags - matching gift tags and wrapping paper! 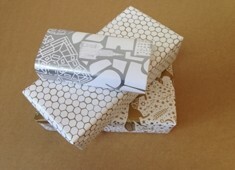 Why not opt for some gift tags to match your eco-wrapping paper - our eco-tags are the perfect accessory. See how Specially Sussex wrapping paper was created - from pictures to print to store!